ExxonMobil – a global company. Many of us have heard from the newspapers or from television about this company and the picture I got was very blurry and confusing. The only fact that was reliable was that ExxonMobil is one of the largest oil refineries. On April 11th, we got the chance to not only visit and learn about ExxonMobil in Tokyo, but also got to know the U35 members. U35 is an interdepartmental club within the company which organizes various activities among the younger employees, and also a host of this internal exchange day with World Campus International, Inc. Immediately after we entered the building, we had a warm welcome from ExxonMobil representative Noritada “Ted” Agatsuma who introduced the company and the schedule for the day. 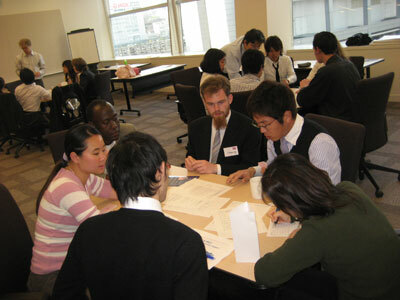 Through the various team building activities led by our guest facilitator Jin Kawamura, the World Campus — Japan participants and the ExxonMobil U35 created a comfortable atmosphere for everyone to discuss and share their thoughts. Then an intercultural training game revealed the fact that people form rules and habits, but when two cultures come together it is necessary to form a new set of rules , a so-called 3rd culture, that we had already done in our World Campus — Japan class! The dinner party was a complete success; we enjoyed the wonderful meal, talked to our new friends and collected a lot of good ideas and impressions about the day from our group presentations. Hopefully this event may continue in the future, it was one of the most impressive learning opportunities during this tour in Japan.